A stroke is where the blood flow to the brain is temporarily disrupted. The disruption can be caused by a blockage in the blood vessel or a bleed, and results in the brain being starved of oxygen. Unfortunately the damaged brain cells are unable to heal themselves. The brain is however an extremely adaptable structure meaning that undamaged areas of the brain are able to compensate for the damaged areas. Physiotherapy after stroke aims to help stroke patients re-learn new movement patterns. Neuro rehab can provide recovery of movement after a stroke, which can sometimes be rapid in the first few months, and then become slower over the following years. Once medically stable, you will be discharged from hospital. Stroke physiotherapy treatment should continue immediately once you have been discharged home in order to maximise your recovery. CN Physio provide a range of exercises for stroke to provide a focused stroke recovery programme. …and many more specific goals you might have. We work together with you to set goals around what you would like to achieve. CN Physio offer a range of treatments all tailored to the individual patient depending on their needs. Our range of treatments are details below, please click through to each page to find out more or contact us for more information. 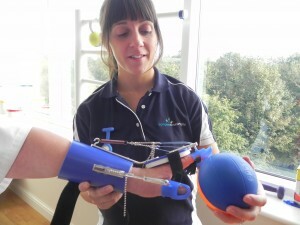 A device that can help stroke survivors with very little arm and hand movement to improve strength and ability to pick up and release an object. The SaeboFlex is an intensive stroke rehabilitation programme where we work closely with you to help you to relearn to use your affected arm and hand. At Complete Neuro Physio we also offer assessment and treatment using Functional Electrical Stimulation (FES). We believe that all people affected by stroke should be assessed to determine if they are appropriate for FES during their stroke rehabilitation. FES is a device that supplies electrical stimulation directly to the muscles that are weak following a stroke, for example, the muscles that lift the foot or open the hand.